Julie Riker loves the beach, and has been going there for years. But when she goes, she doesn’t paint the beach — she paints the beach town and the marshes. Why? The Pennsylvania artist loves the natural landscape, but she can’t resist the town of Chincoteague. “I’m really interested in structures right now, and I like the negative spaces between structures, too,” says Riker. “They create a lot of nice contrasts, with definite light and shadow sides. Buildings have places where lights never get, so you get really good darks. I had a good background in drawing, and I guess that helps with painting buildings. Riker finds plenty of wildlife to accentuate the wild landscape. A group of great egrets that congregated every morning on a creek proved irresistible one morning, and someday, she supposes she will paint the famous wild horses of Chincoteague. 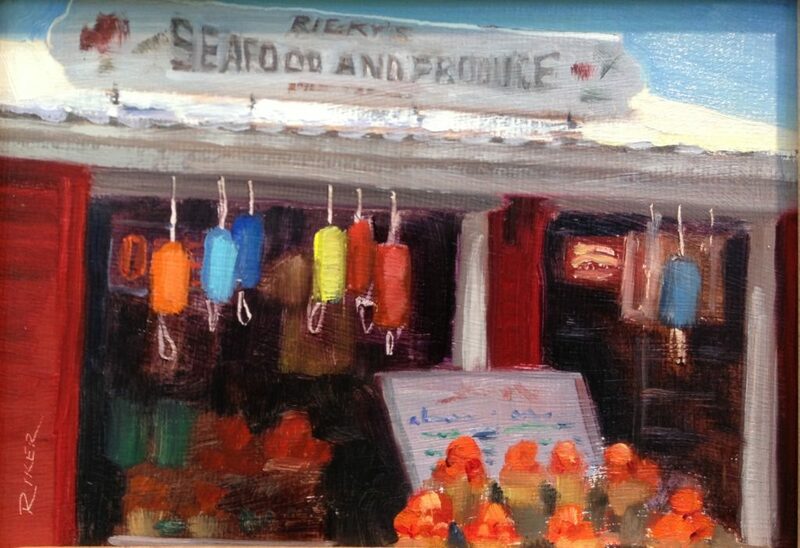 “Ricky’s Seafood,” by Julie Riker, oil, 6 x 8 in.